When i was a little girl, there were a few precious moments in life that held my curious mind in a deliciously happy trance. Small things like spiderwebs glittering with diamond like morning dew, the smell of earth after being caressed by the rain, the beautiful arch of a brilliant rainbow and my mother applying make up. I kid you not. My mother applying make up was my moment of utter rapture. I loved (and still do) watching my mum dress up in gorgeous clothes, bedeck herself with jewellery and accent her beautiful features with a dab of make up. Just watching the whole affair made me feel like I was in a fairy tale that was unfurling with a generous sprinkling of pixie dust and a flourish or two of a magic wand. When it was time to dress,my mum would switch on her vanity table light. The entire room would then be bathed in a glorious amber and there on the bed would lay sparkling her selection of sarees and matching jewellery. My mum selects a saree, matches it with shoes that would put Cinderella to shame and finally pairs it all with pretty jewellery. That done, she would sit down at her vanity table ready to do up her face. 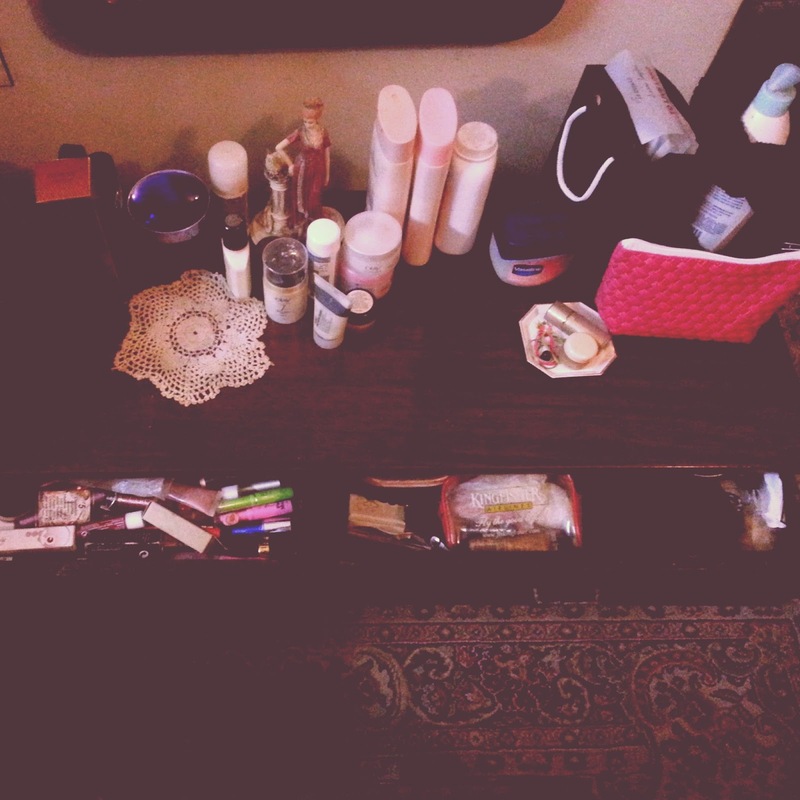 My mum's vanity table definitely needs special mention. It had 4 drawers which my siblings and I were forbidden from opening (an order we gladly DISobeyed!). In each drawer we would discover treasure troves of pretty things from lipsticks to hairclips, dainty pieces of jewellery, vials of lotions, glass bangles, bindis and what not. Each item always held the three of us in absolute awe! The surface of the table would have carefully arranged bottles of creams, perfumes and nail polishes (with a teeny corner reserved for my dad's stuff!). Oh! The number of times we sifted through everything and the number of failed attempts at putting everything back in place...such memories! I fondly remember the way the warm caramel glow reflected off my mum's happy face. A little dab of face cream, a light foundation and a final pat of loose powder to hold it all in place. Then she would stand up and bring her face up close to the mirror and line her eyes in two brilliant strokes. I can't even begin to put to words how her eyes danced the moment the kajal touched her lids. A slight puckering of the lips and on goes the rouge. And then the moment that makes the whole scene worth watching. The way she applied lipstick. To this day I sit watching with wonder the way that little stick of colour glides effortlessly onto my mums lips turning them ravishing red, peachy pink, magnificent maroon and beautiful brown. A quick but perfect tying of the saree-check, jewellery-check, shoes-check and a final look in the mirror. My fairytale Queen was all set. For some reason seeing my mum standing there all dressed up and lovely made me swell with pride and happiness. It's a feeling I can never explain. Before she leaves, she looks at me, shows me her saree colour and asks me to pick her the perfect matching hanky. So thrilled I was to be part of the magic that I would run as fast as my little legs could carry me and plow through her rainbow mound of cloth hankies with the skill of a master. Discovering the perfect hanky was like discovering the most valuable treasure ever! Off I run again clutching that tiny coloured square close to my chest and shyly hand it over to my fairy queen. She would reward me with a wide smile and a wave of her hand as she closed the door behind her. Just the other day, my mum was getting dressed for a party and there I sat 30 years of age feeling all of 7 watching her with the same wonder as I did 23 years ago. A dab of magic, a smear of shine, a pat of pixie dust and a happily ever after. Some things never cease to be breathtaking.